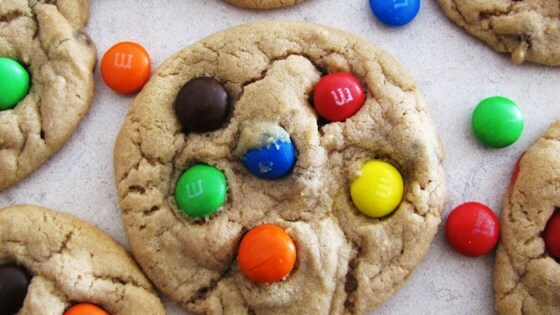 "Cookies using M&Ms® candies, any variety. Old recipe-but ALWAYS a favorite!" In a large bowl, mix sugar, eggs, shortening, and vanilla thoroughly. Add flour, salt, and baking soda to creamed mixture. Blend well. Add 3/4 cup candies. Drop dough by teaspoonful onto baking sheet. Slightly push a few candies on top of each dough ball with remaining candies. Bake at 350 degrees F (175 degrees C) for 9 to 11 minutes. WOW! I just made these cookies and they turned out great! I made them with butter only and they turned out just fine. Thanks for such a great recipie!